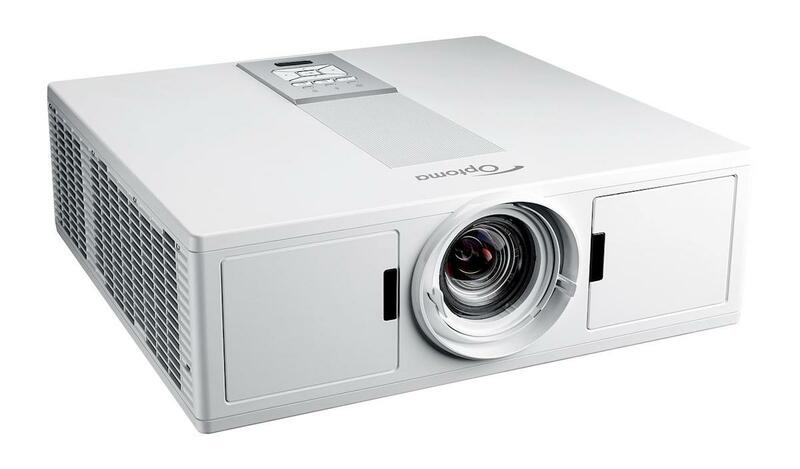 Featuring the ZU510T-W Phosphor Laser Projector from Optoma, is a very well made, high-quality Phosphorus Laser Projector that features 5500 lumens of brightness, native WUXGA resolutions (1920x1200), and the latest 16:10 aspect ratio. 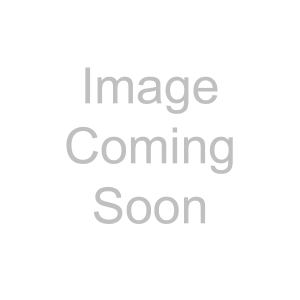 This Pro A/V projector offers users very bright and brilliant image quality by using advanced optical components that feature DURACORE laser light source and DLP Chip technology. The ZU510T-W has a compact size and low-weight, allowing for this device to be implemented as a table top, ceiling, or cart mounted system. Carrying a IP5X-certified dust resistance rating for its optical engine, this device is reliable, cost-efficient and low maintenance, as there are no need for lamp and filter changes, allowing for the user to install it safely and securely wherever they desire without needing to gain access directly to it for standard upkeep and cleaning. Providing up to 20,000 hours of light source operation, this laser projector is ideal for use in boardrooms, conference rooms, higher education facilities, houses of worship, or for small entertainment venue use. 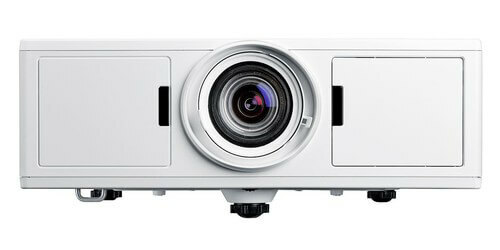 The ZU510T-W definitely fills the gap in the mid-range Pro A/V projector category. 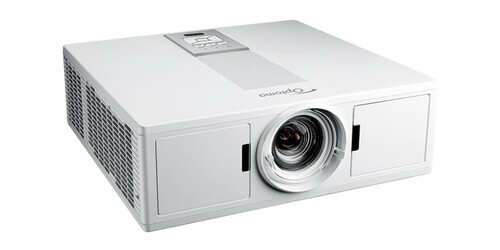 As the 5500 lumens are on par with similar to more expensive projectors and create pristine detailed images and video quality scenes. 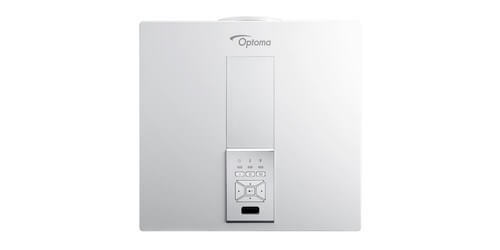 Optoma designed this machine for maximum flexibility and operation, using a solid state laser, that includes a fixed lens with Horizontal and Vertical lens shift, and a unique 1.2 - 2.13 throw ratio with a digital zoom ratio of 1.8x, enabling it to cover a range of interchangeable lens capabilities thus eliminating the need to change lenses or buy additional ones, giving this unit a wide range of uses. 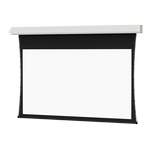 Additionally they have given this great projector system a contrast ratio of 300,000:1 and an amazing 1073.4 million displayable colors to bring your high-quality graphics to life and really make them "pop" off the screen. Streamlined for integration this fixed install projector comes with two 10W built-in speakers and a variety of the most commonly sought after inputs, to include: three HDMI ports and 2x built-in MHL. 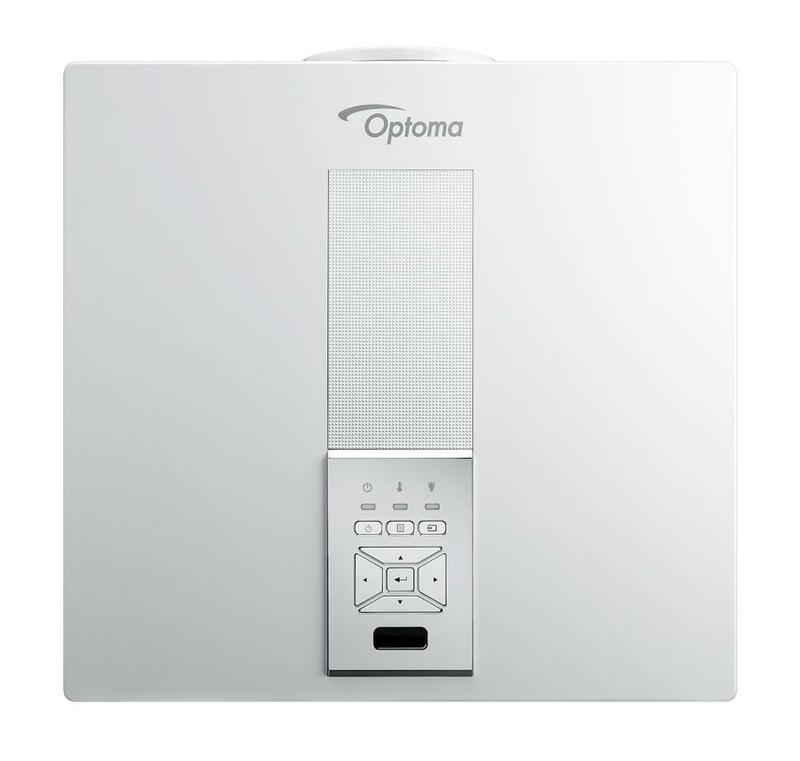 When needing a very low maintenance, well-made projector for your business or presentation system, Optoma's ZU510T-W is the way to go. 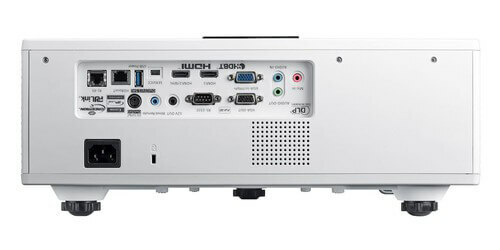 From reliability, long life, 4 corner correction for basic stacking, and 360 degree and portrait mode operation, this phosphor laser projector will give your company a unique edge in the world of Pro A/V and outlast any of the Lamp-Based style projectors. Comes backed by a 5 year or 20,000 hour warranty (whichever comes first), and AC power cord, VGA cable, remote control, batteries, multilingual CD-ROM user's manual, basic user manual, warranty card, USB to Micro USB cable. 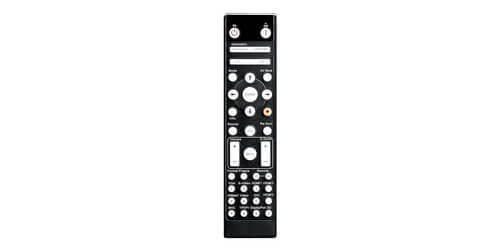 For quality of products and longevity, choose Optoma, a world leading designer and manufacturer in the projection and audio Pro A/V industry. 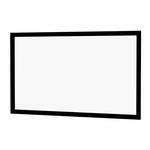 A note on Laser Projectors. 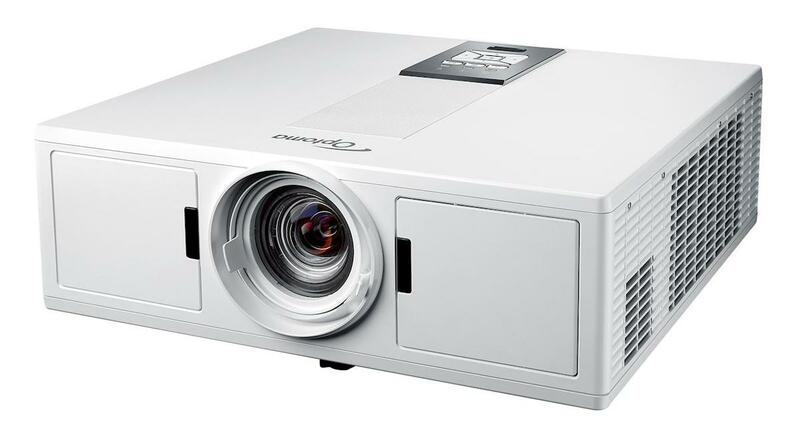 Laser-style projectors are on the cutting edge of projector solutions with appealing features that completely out match standard Lamp-based projection systems. With longer operating life spans, up to 20,000 hours of use for this model, instant on/off operation, resulting in more productivity and less down time waiting for the projector to "warm-up". Beyond being naturally brighter while using less power, and making colors more vibrant another key feature of using a laser projector over lamp-style systems, is the practically maintenance free operation. 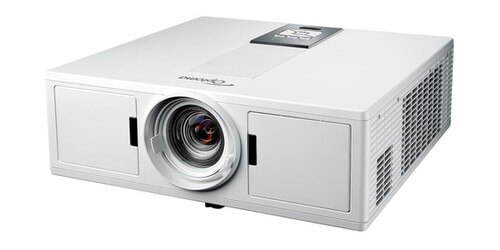 Laser projectors have no filters or lamps to change, making them an ideal solution to be used if you are ceiling mounting your projector or keeping it locked in a secure housing, as you won't be burdened with constant filter cleaning or swapping out lamps after they start to lose their luster. Power consumption and sound are 2 other key differences in laser systems, they technically use less power to create an image and have almost zero power waste as they produce only the colors that are needed, equally they will give deeper and richer colors with a huge dynamic contrast ratio by potentially turning down the laser or shutting it off during dark scenes. 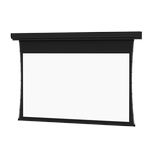 These projectors are also safe to use and do not cause harm on users eyes, as all light emitting from the projector passes through a diffuser before leaving the system with implemented technology that removes laser "sparkle" that is commonly found with laser pens when they are shined on to a surface. Image Size: 27.9" - 301.8"